We don’t often talk about the national housing market, because, well, that isn’t really a thing. You read that right. There is no national housing market! The same way there is no national weather forecast. You don’t grab an umbrella in Miami based on the weather in Seattle, do you? So why would you base a decision to buy or sell real property in Minneapolis on data from Phoenix, Cleveland, Las Vegas and St. Louis? You wouldn’t. Because that would be silly. So from the standpoint of a family or individual in the midst of a local decision-making process, national data is more or less worthless. Worse, it can actually lead to negative outcomes if a local decision was made based on national figures. Perhaps a Case-Shiller report showed that home prices are rising across their 20-city composite index. But that doesn’t mean prices are rising in every neighborhood or city, or even a particular section of a neighborhood. However, when it comes to bench-marking how we’re doing in Minnesota against other states, national-scale market data can play a marginally useful role. The folks at Keeping Current Matters (KCM) have taken information from NAR’s Monthly REALTOR® Confidence Survey to generate a heat map showing hot spots and cold spots around the country. The darkest blue represents states where homes sell quickly (30 days and under). 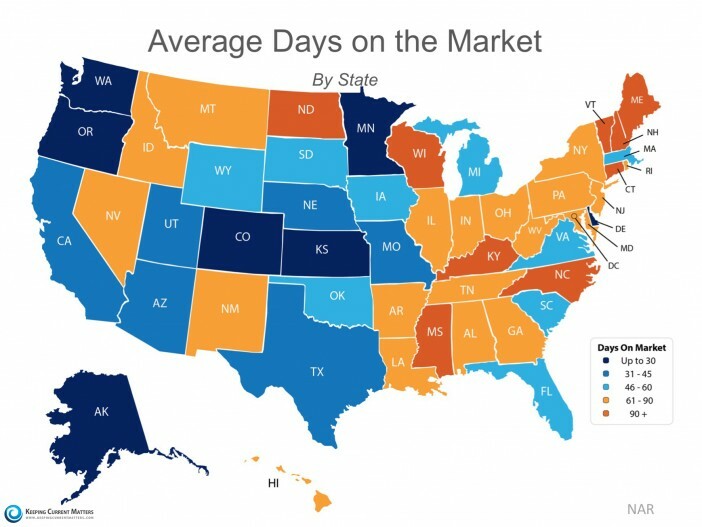 The darkest orange represents states where homes tend to sell in over 90 days. As you can see (and as most agents know), Minnesota homes tend to sell quickly. Our state is in the top quintile, among a group of only five other states. It’s a safe bet that our acute inventory shortage plays a large role in this dynamic, but our extremely competitive labor market, attractive business climate, affordable housing stock, high quality of life, diversity, top-notch schools and our treasured parks and water bodies also play a big role in attracting and keeping people here. That translates into strong demand for housing, which—when combined with very low supply levels—means homes tend to sell pretty quickly.